If you're like most people in the United States, you probably took several American History classes in elementary school, including a section on the Civil War. So how much do you remember from grade school? Take this quiz to find out. It will test you on some very specific details of battles and generals. Don't be discouraged if you don't know all the answers, because this is somewhat difficult. 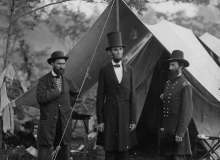 Approximately how long did the Civil War last? Who led the raid on Harper's Ferry? Which Union general was referred to as "the Young Napoleon"? Which of these was NOT part of the reasoning behind "Stonewall" Jackson's Shendandoah Valley Campaign? What was the main advantage of the Confederate army over the Union army? Which battle was the single bloodiest day of the war? What type of attack gave Robert E. Lee the greatest victories? Who was the only Confederate soldier executed by the United States for his actions in the Civil War? What was the most devastating Confederate loss in the Battle of Chancellorsville? What piece of legislation allowed slaves to fight in the war? What was the first all-black regiment in the Civil War? Who led the (relatively) famous charge that began the Battle of Gettysburg? What was the last great Confederate victory in the Civil War? What did Grant do after the Battle of the Wilderness? requested reinforcements from Washington, D.C.
What nickname did Grant earn for his overwhelming casualties at Cold Harbor? We all know (or should) that Robert E. Lee surrendered at Appomattox Court House--but whose house was it in? Who succeeded Abraham Lincoln as president? What is the official name of the time period after the Civil War in which the South and the North attempted to reunite? What legislation permanently abolished slavery? Early American History Quiz by Sean K.
Quiz topic: How much do I really know about the American Civil War? You can find more quizzes like this one in our Wars and Conflicts Quiz category.